It seems like every manufacturer and his dog is rolling out Windows Phone 8 smartphones at the moment. HTC is among the companies battling it out to offer the top Windows Phone 8 device, and will be hoping its HTC 8X and 8S handsets will cut it against strong competition from the likes of Samsung and Nokia. The HTC 8X is the new flagship device from the Taiwanese firm, whereas the HTC 8S is a more budget friendly mid-range mobile. But which one will suit you best? You’d be forgiven for thinking that you’re looking at two phones from the Nokia Lumia range, as the HTC 8X and 8S both take design cues from the Lumia 800 and 900. Both have angular chassis; however, the HTC devices feature a curved backplate that makes them more comfortable in the hand. They don’t feel too pointy and sharp when sliding into pockets either. HTC’s last round of smartphones was headed by the One series of Android devices, with the HTC One X taking the flagship mantle and the One S offering a more affordable option with slightly scaled down specs. The HTC 8X and 8S are the new Windows Phone 8 equivalents, with the HTC 8X taking the flagship role and the HTC 8S being the more affordable option. HTC’s new generation of smartphones has moved on from the One series, coming in a selection of modern colour options that are vibrant and eye-catching. The HTC 8X has black, cobalt blue, red, and fluorescent yellow variants, and the HTC 8S has black, red, navy blue and grey options which all feature a ‘dipped’ effect on the bottom of the device, that looks like it has had its bottom dunked in paint. Of course you can plump for plain black if you’re a traditionalist, and although the two-tone effect on the HTC 8S won’t be to everyone’s tastes, it’s likely to appeal to a youthful market looking for a mobile to wow mates with. When it comes to taking pictures the HTC 8X’s 8 megapixel camera is definitely superior to the 5 megapixel effort sported by the HTC 8S. The results from the HTC 8X’s camera are pretty impressive, offering sharp detail and high quality images even when taking a quick snap on the go. The snaps from the HTC 8S aren’t quite as good , especially in low light conditions, but if photography isn’t your main concern the images are ok for sharing on the likes of Twitter. 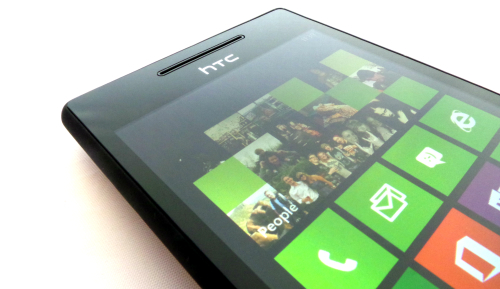 The HTC 8X’s front-facing 2 megapixel camera is also a joy to use, with its ultra wide-angle lens letting you capture nearly triple the area than that of a standard front-facing snapper. So, when you’re grabbing a shot at arm’s length of you and your pals on a night out you’ll be able to fit everyone in. Sadly, the HTC 8S doesn’t have a front-facing camera at all, so those who like to use Skype to video call friends and family abroad should take this into consideration. Those that use their mobile to store all their music will be pleased to know that both handsets feature the Dr Dre-endorsed Beats Audio technology, which offers deeper bass and crisper vocals across all audio outputs. So whether you’re listening to the new Skrillex track or watching Lord Of The Rings whilst using Beats Audio headphones, the sound quality will be pretty amazing. If you’ve got the money to spend then the HTC 8X is the handset that offers you more features with a better camera, faster processor and larger, high definition screen. However, if you are watching the pennies but still want to bag a colourful Windows Phone 8 device the HTC 8S is a great choice. Why? It offers all the great Windows Phone 8 functionality with the addition of Beats Audio tech all within a lightweight and cool-looking case. If we had to pick a favourite though, we’d choose the HTC 8X every time. Abbi Cox is a technology writer for Phones 4u – the UK’s best destination for the latest mobiles, tablets and accessories.